The Giga-carrot is a carrot grown by the Wigglers of the Wiggler Family Farm in Dimble Wood. 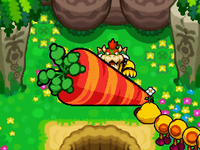 In Mario & Luigi: Bowser's Inside Story, Bowser discovers the carrot when looking for a Banzai Bill. He pulled it out, with help from Mario and Luigi in the Arm Center. When a Wiggler sees this, it says Bowser has to eat the carrot. This must be digested by Mario and Luigi in the Gut Check. After eating it, Bowser asks for the Banzai Bill, but Wiggler forgot it and gets angry at Bowser, because he ate the carrot and gets into a fight with Bowser. If Bowser fails to eat it the first time, it will be replaced with a bunch of smaller carrots. He later blames the Giga-carrot for his putting on a few pounds after the "victory feast" in one of the questionnaires directed to Bowser. In Mario & Luigi: Bowser's Inside Story + Bowser Jr.'s Journey, the Giga-carrot appears in the Bowser Jr.'s Journey mode, where it appears as an ingredient that Bowser Jr. must collect to make the Skeletone Formula:D. He takes a bite out of it, obtaining a piece of it. This page was last edited on January 18, 2019, at 17:38.